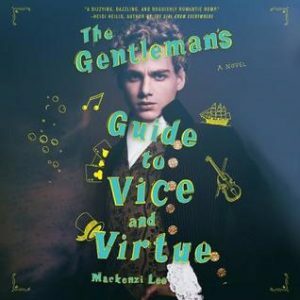 I borrowed a copy of Mackenzi Lee‘s The Gentleman’s Guide to Vice and Virtue through Hoopla. I went back and forwards with this one, sometimes really loving it and other times distinctly disliking the main character and/or rolling my eyes over too-stupid-to-live stunts that make no sense, other than being obvious bids to move the plot in certain directions. While I loved the narrative style and Monty’s sense of self-depricating humor, I thought the whole thing got too ridiculous to believe by the end. The narrator, Christian Coulson however did a MARVELOUS job with the story. This entry was posted in books/book review and tagged audio book, book review, M/M, romance on June 1, 2018 by Sadie.